During my time spent at the Fox Center, I researched cases of hysteria in St. Elizabeths’ Hospital’s archive at the National Archives. Here I will discuss some of the findings and implications of my research, as well as some of the surprises and difficulties experienced along the way. For my thesis, I adopted the genealogical method developed by French philosopher Michel Foucault. My analysis of the hysterics I found in the archive is inspired by Foucault’s reflections on his own work with archival texts. I used Foucault’s approach to the past as a guide throughout my encounter with St. Elizabeths’ archive, my thesis, and my personal reflection on the experience. St. Elizabeths’ hospital was a government hospital founded by an Act of Congress in 1855. Patients are admitted to St. Elizabeths’ from the District of Columbia, the Merchant Marine, and the U.S. Soldiers Home. Not having any idea of what I would find, I began my search at the beginning of the patients at St. Elizabeths’ stories – the admissions register: a large, canvas-bound, ledger, the admissions registry dated from 1855-1941. Included with each entry is the patients name, diagnosis, age, race, gender, release date or date of death, occupation, stage in life, and case number. When I first saw an entry with a hysteria diagnosis, I couldn’t believe it. There in front of me was evidence that hysteria diagnoses were not fictions, but real instruments used to process and sort individuals (for context, much of hysteria’s history is represented as a great debate on the disease’s legitimacy). As I progressed through time, hysteria diagnoses increased. Compared to other diagnoses such as dementia, epilepsy, mania, and melancholia, hysteria was rare. Hysteria appeared once every couple of years for decades until the end of the 19th century, where it appeared every few days. In the registers dating from 1890 to 1900, I found nearly 30 hysteria diagnoses. I spent the first two days at the archive with the admissions registers, recording case numbers for hysterics so that I could later acquire their patient files. There was something haunting about the admissions registers. It unsettled me that different styles of handwriting suggested that many people participated in cataloging new patients. The hospital’s administrative workers who filled out the form likely didn’t give much thought to the power behind their scribbles. I couldn’t help but wonder how this administrative practice was invented and where it came from. What historical deployments led to the use of admissions registries? Why do the registries recount patients’ “stage in life” or occupation? What determined the different categories of intelligibility that were faithfully recorded for every entry? At the end of my second day in the archive, I reached a road block. Of the 40 cases of hysteria I found, only 7 had corresponding case files. The archivist informed me that St. Elizabeths’ only kept every five years of patient files and most of the hysteria cases I had found in the admissions registry had files that had been destroyed. I was shocked at the complete arbitrariness and chaos with which the archive is structured. How could documents representing “the most intense point of a life, the point where its energy is concentrated…where it comes up against power, struggles with it, attempts to use its forces and to evade its traps” have so much power over an individual’s life and organize our present reality no longer exist (Foucault, “Lives of Infamous Men”)? The hysterics whose files weren’t destroyed were “preserved down to our day by improbable encounters” – they were admitted to the hospital in a year that wouldn’t be later randomly discarded (Foucault, LOIM). In order for them to reach me, “a beam of light had to illuminate them, for a moment at least. A light coming from elsewhere. What snatched them from the darkness in which they could, perhaps should, have remained was the encounter with power; without that collision, it’s very unlikely that any word would be there to recall their fleeting trajectory” (Foucault, LOIM). Those “brief and strident words that went back and forth between power and the most inessential existences doubtless constitute, for the latter, the only monument they have every been granted; it is what gives them, for the passage through time, the bit of brilliance, the brief flash that carries them to us” (Foucault, LOIM). I struggled to wrap my head around the fact that all that remained of most of the hysterics I found was their names, short biographical details, and the diagnosis that struck them down. Because power had “marked them with its claw,” glimpses of their lives remain for us today in the form of a few words (Foucault, LOIM). The more time I spent with the admissions registry, the more it sunk in that “these discourses really crossed lives; existences were actually risked and lost in these words” (Foucault, LOIM). It’s hard to justify the intensities I felt in the archive. Not only can these intensities never be described with any certainty, because “they can no longer be separated out from the declamations, the tactical biases, the obligatory lies that power games and power relations presuppose,” they are also connected to a desire to rectify the loss of specificity and brilliance of the lives of the hysterics as the archive presents them. Thus, “the dream would have been to restore their intensity in an analysis” and render complete what the archive presents as mundane, insignificant, and base (Foucault, LOIM). I cannot help but wonder if what became of “these lowly lives reduced to ashes in the few sentences that struck them down” reflects what I will one day become. What if someone found my medical records in a future archive? Would they take the monotony and dull irrevocability of the discourse of medicine as an adequate account of my life? Is the appropriate temptation to resist medical authority by somehow repairing the damage of institutionalization by uncovering some forgotten narrative, by giving the disregarded a voice? What could I tell you about Laura Rice other than that her sister missed her? That her mom often sent clothes and fruit? That I could feel her mother’s grief where her pen pressed the paper imprinting “is she well?” with furrows that set those words apart from the rest of her scribbles? That somehow these parchments saved on our behalf are supposed to provide enough information to “understand why it had suddenly been so important in a society like ours to “stifle” (as one stifles a cry, smothers a fire, or strangles an animal) a scandalous monk or a peculiar and inconsequential usurer” (Foucault, LOIM)? The explicit connection between her patient file and her confinement was obvious. These were the documents kept to justify her insanity. Yet nothing can be said about Laura other than that she lived, was hysterical, was admitted, and died. The pure shock and intensity I encountered when I first read Laura’s file, a fourteen-year-old girl who lived almost 50 years in St. Elizabeths’ where she eventually died, suggested to me that she was more than the collection of repeated phrases that generations doctors used to describe her. The shock of realizing Laura was a real person and the documents in my hands were the transcribed version of the power plays that solidified her fate was surreal. I could not separate the shock that “sparks through” the patient file from the “vividness of the words” used to describe Laura or from the “jostling violence of the facts [those words] tell” (Foucault, LOIM). Regardless, I was moved by the realization that “behind these quick words which may well have been false, mendacious, unjust, exaggerated,” Laura “lived and died, with sufferings, meannesses, jealousies, vociferations” (Foucault, LOIM). Carly Moore is a senior majoring in Philosophy and Women’s, Gender, and Sexuality Studies. Her senior honors thesis approaches hysteria through the lens of the genealogical method introduced by French philosopher and historian Michel Foucault. Specifically, her thesis looks at cases of hysteria in modern times by analyzing various phenomena of what French feminist philosopher Luce Irigaray calls, “hysterical mimicry.” Through her use of Foucaultian genealogy, she hopes to expose the structure of power-knowledge that represents hysterical symptoms as mimicry. The concerns weighing on me before a show opens are will people show up and if they do attend will they enjoy their experience. I love my friends and family dearly, but perhaps having them sit in a dark room for a long time may not be the best format for engaging them. Why do people not enjoy the experience of going to theater like generations of the past? This question guided my research last semester as I attempted to sift out the attributes of theater practices throughout history that are worthy of reexamining. Was it the material? The seating arrangement? Were people sitting, standing, reclining, participating? Theater cannot exist without the audience. The patrons that make up our community need to have a fulfilling relationship with theater or theater will simply cease to be a priority. This same search for the manual for gripping and meaningful theater has resurfaced during times of transition and innovation. Today all live performance must respond to the acceleration of everyday life and the immediacy that technology has placed on people’s impulses. In addition to my research, one of the main components of my work with Microtheatre has been producing Microtheatre shows on Emory University’s campus. Last November, I collaborated with my peers to produce Microtheatre Emory. Originally my goal was to focus on the spectator experience, but I soon found out what this project would mean for my theater community at Emory. With the help of an Emory Center for Creativity and Arts grant, I organized and produced Microtheatre Emory, an exciting evening of four rotating 15 minute plays written, directed and performed by students. We entertained approximately 100 Emory students, faculty, community members and theater professionals. Partnering with Emory’s Media, Literature, and Arts Outreach House (MLAO), I implemented a way to support the efforts of the student arts community by providing a full night of entertainment and a new opportunity for students interested in theater to hone their craft. After reviewing the successes and challenges from last semester’s production and an opportunity to visit the only Microtheatre in the US, Microtheatre Miami, I am in the final stages of producing Microtheatre Emory again. On March 26, 2018, Microtheatre Emory will take audiences on another exciting adventure of four new plays. You can register for the upcoming show by clicking here. As one of this year’s undergraduate Fox Fellows, I am gaining tremendous amounts of wisdom from attending Fellows’ Lunches and seeking advice from senior fellows. In our lunches, specialists in their fields present their work-in-progress. Afterwards, other fellows ask questions which not only enhance the presented work, but also offer everyone in the room an alternative perspective for digesting and relaying information. The rapidly approaching deadline for my honors thesis dominates most of my thoughts these days, and hearing such high level discourse has relieved some of that stress by improving my writing. Most of the fellows leave their doors open. The luxury of poking my head in to gripe about writers block with so many tried and true scholars allows me to share in universal academic struggles. I cannot express my gratitude for the quick conversations that end with “why don’t you try…”. More often than not, I leave those conversations motivated to apply the lessons I have learned. Soon my writing’s momentum has picked up and I am well on my way to finishing my allocated work. The Fox Center has provided me the space and the mentorship I needed to complete my honors thesis project. Because the Fox Center has so many scholars from a wealth of disciplines, I find it fascinating to hear the fellows’ work held under the perspective of another field. This has been valuable for me as I consider the implications of what studying Microtheatre can mean for theater, but for the communication of human experience. Ultimately, I have found a common goal amongst the scholars of teaching empathy. 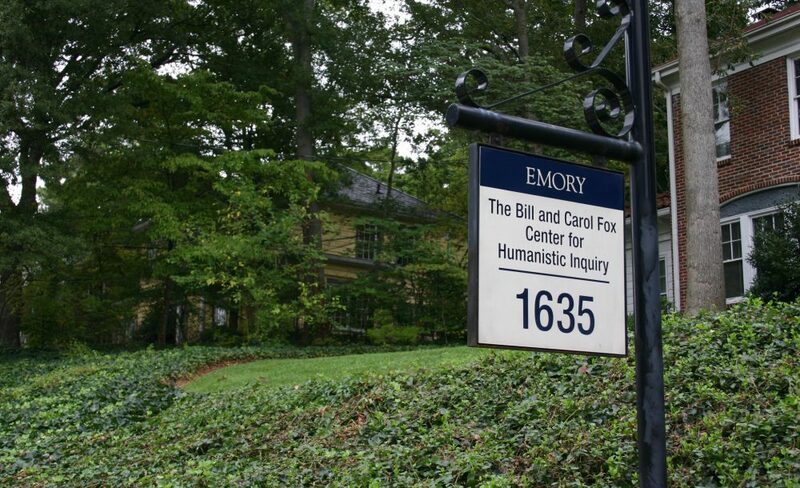 Certainly, this must have been the goal of Bill and Carol Fox when they so generously supported the work of humanistic inquiry. Cameron Frostbaum is senior with a double major in Theater Studies and Political Science. His honors thesis explores the Spanish Microtheatre Movement as a new theater practice for contemporary audiences. Frostbaum specifically responds to the National Endowment for the Arts study of the three greatest obstacles to participating with the performing arts: time, accessibility, and cost. The Sistema Único de Saúde (SUS), the Brazilian Healthcare System, offers health services to the population free of charge. All of the services offered by the UBS Bom Retiro, including home visits, doctor’s appointments, medications, etc. are free of charge independent on the status of the patient. Anyone who resides in Brazil, whether the person is a Brazilian citizen, a legal or illegal immigrant, has the right to access medical services. Doris Cikopana is a senior in the pre-medicine track, double majoring in International Studies and Spanish and Portuguese. She is currently writing an honors thesis on the inequality of access to healthcare in Brazil. Doris conducted her research during the summer of 2016 in a clinic based in Bom Retiro, São Paulo, traditionally recognized as a diverse neighborhood with a high population of immigrants. Her thesis explores access to government services in Brazil from the slave trade in the 18th century through the time of the military dictatorship, the creation of Brazil’s current healthcare system (SUS), and access to health services in Bom Retiro for immigrants.